Hundreds of protesters descended on the convention of the Alexander Graham Bell Association for the Deaf and Hard of Hearing taking place in Milwaukee, Wisconsin this weekend. The Deaf Bilingual Coalition brought together people from around the country to demonstrate against what it claims is a bias by the Bell Association against sign language. A spokesman says Bell is not against sign language and supports choice for parents- whether that be technology like cochlear implants or traditional sign language. Good news for Gallaudet. The school’s accreditation has been reaffirmed. The DC University has been on probation for nearly a year. The Middle States Commission on Higher Education took the action after student demonstrations. It determined that a Gallaudet failed to meet a majority of commission’s 14 standards. The EarPopper is a noninvasive way of treating multiple ear infections. Approved by the FDA three years ago, it can also relieve pain from flying in an airplane and sinus infection. When your ears “pop” they are following a natural way of relieving pressure imbalances of the middle ear. The EarPopper is a device for equalizing pressure in the middle ear by treating fluid buildup when the natural method doesn't work. It doesn’t work for all ear conditions and patients. Your doctor can advice you whether its appropriate for a particular situation. The Gallaudet University Board of Trustees has a new member. Senator Sherrod Brown is a Democrat from Ohio with a master’s degree in education. He joins two other members of congress on the board: Republican Ray LaHood of Illinois, and Democratic Congressman Lynn Woolsey of California. They each will serve two-year terms. Carle Foundation Hospital in Urbana, Illinois broke ground yesterday on a new facility that will help children with hearing loss. The $6.25 million project should be open by the end of next summer. It brings the ECHO center - Expanding Children’s Hearing Opportunities and the Carle Auditory Oral School under one roof. The hospital has fitted more than 200 children for cochlear implants and 400 for hearing aids. The ADA law may soon have some new teeth. The US House of Representatives passed a bill yesterday by a vote of 402-to-17 that would expand workplace discrimination under ADA to include people with hearing aids. Since ADA became law, the Supreme Court has limited ADA's protection in that area, leaving out people with partial physical disabilities and physical impairments that can be treated with medication or devices (like hearing aids). The legislation now moves to the Senate for consideration. Ryan Ketchner is working his way to the major leagues. He’s pitching for a minor league team in Tennessee called the Diamond Jaxx, a double-A affiliate of the Chicago Cubs. Ketchner was born deaf. Hearing aids give the left-hander about 10% hearing ability. Ketchner was Seattle's 10th-round pick in the 2000 draft and earned the USA Deaf Sports Federation male athlete of the year in 2003. He had a 3.45 earned-run average and won playoff MVP honours for the California League-champion Inland Empire 66ers. In 2004, he was a Southern League all-star with Double-A Jacksonville. But arm trouble lead to surgery in 2005. If Ketchner makes it to the big leagues, he would be the first deaf major league pitcher in one hundred years. Videophones have been placed in the Library of Congress in Washington, making the Library of Congress one of the first federal agencies to set up a videophone network agency-wide for the benefit of staff members who are deaf or hard-of-hearing. There are 20 deaf staff members who work in a variety of positions throughout the library. Rachel Coleman, host of the PBS show Signing Time, was up for an Emmy Award. But she didn't win. The Outstanding Performer in a Children’s Series. That honor went to Bindi Irwin, daughter of the late Steve Irwin for her Discovery Kids show. After Coleman's daughter was born profoundly deaf, Rachel learned ASL and started teaching sign to hearing children through song. She writes all the music for Signing Time. She now lives in Salt Lake City. 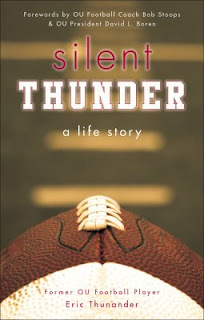 Eric Thunander tells his story in a new book called Silent Thunder. The deaf college football standout was a part of the University of Oklahoma’s 2000 National Championship team. But his book not only chronicles his triumphs but his low points. The defensive end endured abuse and multiple foster homes as a child, finally hitting the bottom when a head injury ended his football career. He wound up trying to commit suicide. But Thunander got back in school, completed his degree and is now a motivational speaker after turning his life over to God. There may be a new way to diagnose hearing problems in babies. Looking at their eyes. Researchers at the University of Oregon say a person's eyes will slightly dilate in response to sound. And the pupils will respond in proportion to the volume of that sound. An outfielder for the minor league baseball team in Everett, Washington has a severe hearing impairment. The AquaSox like the speed of Tyson Gillies. The 19-year-old has been in the starting lineup for most of the games so far this year. He grew up in British Columbia and the Seattle Mariners picked him in the 25th round of the 2006 draft. Last season, he batted .221 and stole nine bases for a club in Peoria, Arizona. Robert Harris became the first deaf student to intern the Frederick, Maryland Police Department this spring. His experiences included teaching sign language to officers and playing the role of an uncooperative suspect for a class of recruits. Now, the 17-year-old is working on a visual communication tool to help first responders interact with people who have hearing loss. The city of Frederick has more than 2000 residents who are deaf, thanks in part to the Maryland School for the Deaf being located there. In order to receive telephone calls through Sorenson Communications video sign language interpreter services, users have had to give out two numbers. One for the call center (in order to connect to an interpreter so that the caller can see the interpreter's sign language on a video screen) and another phone number for the person being called. But not anymore. The company is now making it possible for deaf customers to give out just one number. All three parties will be connected automatically. This also means a deaf person calling another no longer has to go through a call center to be connected through a video screen. The Maryland School for the Deaf is getting a new elementary school this year as part of a $20 million project. The building is southeast of the main campus in Frederick. Along with the school, a 72,000-square-foot Family Education Complex is going up. It will host sports and academic competitions in its gym and include a cafeteria, an audiology and speech center and an elementary and a family education school for babies. James Sorenson and Tiffany Williams-Granfors have agreed to serve on the Gallaudet Board of Trustees. James Sorenson heads up Sorenson Development, a major force in videophones and video relay services out of Utah. Gallaudet alum Williams-Granfors oversees the Winter and Summer Deaflympics and the World Deaf Championships. The University of Tennessee is putting off a decision on whether to cut its Department of Audiology and Speech Pathology until October. Parents and program supporters came out Friday to rally in support of the department. US News and World Report ranks the program among the 25 in the country. Another program in the state, at Nashville's Vanderbilt University, is number one. The University of Tennessee says that even if the department closes, the Hearing and Speech Center will remain in operation. It serves some 2500 people. Gallaudet University has raised $2,300 from students and faculty to support deaf victims of the cyclone in Burma (also known as Myanmar). The donation is being sent through non-profit organization assisting deaf people worldwide called Partners in Excellence. A relief worker involved with the Mary Chapman School for the Deaf will handle the distribution of the funds. The government in Burma provides no social services to deaf people. A growing number of concert halls and movie theaters are adding what's called an induction loop system. These facilities broadcast directly from the output of instruments and microphones to hearing aids equipped to receive them. Among the places you can tap into the signals are the DeVos Performance Hall in Grand Rapids, Michigan and the Rialto Cinemas Lakeside in Santa Rosa, California. Researchers say advances in genetic research over the next 50 years will make most hearing loss preventable or curable. John House who leads the House Ear Institute believes it is only a matter of time before scientists are able to regenerate the cochlear hair cells that allow us to hear. After the genes responsible for age-related hearing loss are discovered, researches should be able to manipulate those genes to prevent and treat hearing lose. There is already some success at regrowing hair cells in rats. House says within the next 20 years, treatments will eliminate significant hearing loss for nearly a third of those who develop problems by age 60. Eventually, hearing loss may become an unheard-of problem. Garth Brooks played a benefit concert this weekend for deaf children. He appeared at the 8th annual So the World May Hear event in St. Paul, Minnesota. It was sponsored by the Starkey Hearing Foundation and raised $5 million. Karen Alkoby becomes the first deaf woman in the US to earn a PhD in computer science today. She’s graduating from DePaul University. She helped to pioneer behind a computer-animated dictionary. It interprets English words typed into the program and gesture them into American Sign Language. It helps in situations where hiring an interpreter would be impractical. Alkoby’s dissertation involved determining how the human brain interprets shapes like those made by hands in ASL. This may help with creation of a ASL-to-English dictionary. A rally yesterday in Knoxville brought out families of deaf children to protest cutbacks in the Department of Audiology and Speech Pathology at the University of Tennessee. Budget cuts may lead to the department's shut down in the next couple of years. The programs helps some 2500 patients. A vote is planned this Thursday by the UT Board of Trustees on the department’s future. Could you lose your hearing through a kiss? Apparently so. A professor at Hofstra University in New York says a Long Island woman who lost hearing in one ear after her four-year-old daughter gave her a long sucking smooch in her ear. The force of the kiss yanked out very small nerves as it pulled her mom's eardrum out toward the ear canal. Professor Levi Reiter warns parents to avoid kissing into the ears of newborns. He's preparing an article for publication in an audiology journal about the case. The City Council of Castle Hills, Texas has given the go-ahead for a group of deaf priests to operate a seminary in the town. The vote in the San Antonio suburb was four to one. Tom Coughlin plans to train men who want to become priests in a 8100 square foot home. He was ordained as a first deaf priest in North America in 1977 and calls his group the Dominican Missionaries for the Deaf. Antoinette Abbamonte’s first book tells the story of a boy with deaf parents. The deaf actress pulls from her own experiences as she describes how the boy teaches his friends about Deaf Culture with the help of a special tree. 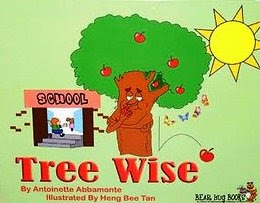 Tree Wise is aimed at elementary age children and has a future on the stage. The National Theater of the Deaf plans to produce a play based on the book. Marlee Matlin is working on her memoir. The Academy Award-winning deaf actress plans to call her book I'll Scream Later. It’s due out next year and will be published by Simon Spotlight Entertainment. Matlin has several books already published including the novel Deaf Child Crossing along with two books for teens: Leading Ladies and Nobody's Perfect. A new study may shine some light on why deaf and hard-of-hearing students tend to lag behind their hearing peers in math. The National Institutes of Health is giving the Rochester Institute of Technology’s National Technical Institute for the Deaf more than $2 million to test more than 1000 students. Researchers will spend four years trying to better understand how deaf and hard-of-hearing students learn math. They say the studies have suggested simply improving communication is not enough to level the playing field and hope this research will reveal the missing piece. A deaf youth moment launches next month called Deaf Youth USA. The group’s first gathering will take place in Louisiana at Bayou Segnette State Park. Organizer Melissa Malzkuhn hopes several hundred will come to the forums, discussions and workshops. Deaf Youth USA has a Facebook site to get youth interested. The closest thing to it is the Junior NAD which focuses on junior high and high school students. Interpreters will fill the courtroom during a Sioux Falls, South Dakota trial. Administrators from the South Dakota School for the Deaf are being suing by former students. They allege the administrators didn’t take action to stop sexual abuse at the school. The plaintiffs have their own sign language interpreters, the defendants have their own interpreters and the court has decided to fly a couple of them in from out-of-state for the judge. He didn’t want to use local terps with ties to the case. Even though Minnehaha County has paid for interpreters in past cases, commissioners say they shouldn’t have to pay this time. That’s because the bill is expected to top $20,000 just for the court’s interpreters. The trial is expected to start today and run for a couple of weeks. The University of Alberta and Lakeland College in Canada are together starting a training program for sign-language interpreters this fall. The move is in response to the shortage of interpreters in the country caused by the increased number of deaf students moving into regular schools and universities as well as requirements that hospitals provide interpreters. This will only be the fifth such program offered at a college in Canada. The Alberta program will start with 16 students. Applicants must be fluent in ASL and have taken a deaf-studies program. It will take them two years to earn a degree. A concert to benefit deaf children in Ethiopia takes place a week from today in Springfield, Missouri. Uplifting Humanity Thru Harmony takes place at 7 pm at the Gillioz Theatre. Folk-rock singers Alea and Alexa Kilgore will be featured along with four other artists. The event got its start from a local couple who adopted two deaf children last year from Ethiopia. Tickets are $10 each and proceeds will go to a group called Ethopian Child. A global positioning system has added sign language to its virtual tours. The GPS Ranger is a handheld device with a four-inch LCD screen. It uses a tool developed by BarZ Adventures of Austin, Texas that allows captioning and American Sign Language options to accompany virtual tours. The technology was launched along with a multimedia tour of the Texas capital with the help of CSD (Communication Service for the Deaf). The tour is available from the The Austin Convention & Visitors Bureau for $11.95. It will become available in other cities as well. Congress is considering legislation that would require closed captioning for video streamed on the Internet. Some programs and networks caption these Internet streams, but others do not. The 21st Century Communications and Video Accessibility Act of 2008 would apply the same standards imposed on television broadcasts. Congressman Ed Markey held hearings this month but has not introduced a bill. The biggest problem is the lack of a single technology that delivers Internet video. Viewers use different programming formats to receive the stream. Washington’s International Spy Museum says it has cut a deal with the Justice Department over compliance with the Americans With Disabilities Act. The changes were sparked by a complaint to the Federal Agency four years ago. Since then, the Spy Museum has spent some half a million dollars getting its facilities up to speed. This includes adding closed captioning to video presentations and offering sign language interpreters on request. When visitors approach a videotape or film they can access the closed-captioning by touching a small device worn around the neck. Interpreting for the Theatre Institute is taking place in New York at The Juilliard School. Sponsored by the Theatre Development Fund, the program teaches advanced techniques for signing plays and musicals. Students must submit a videotaped audition to gain acceptance into program and most of them interpret for Broadway road shows and regional theatre companies. One of Central Florida's best bowlers is deaf. Deanna Walden rolled a 190 average for the Tavares High School team in Lake County, Florida. Walden was honored yesterday with the Bill Buchalter Spirit Award (the award was named for a local news reporter who retired after a long career of covering sports). Not only strong in sports, the profoundly deaf teenager received her diploma last week ranked academically among the top 20 in her class. Amazingly, Walden did not have an interpreter to assist her until she was a junior. She’s now heads to college at the Rochester Institute of Technology. Big Brown will be going for the Triple Crown today at the Belmont Stakes. Jockey Kent Desormeaux hopes to win an unforgettable memory for his son. Nine-year-old Jacob Desormeaux has Usher syndrome. He was born deaf and is slowly losing his sight. Big Brown is a 2-5 morning-line favorite to win the mile-and-a-half race.